When it comes to the future of universities and colleges around the world, higher education leaders are all too aware it's not just domestic trends that can impact the way they operate their institutions. There are also external, global factors that can change the trajectory of the industry. Along these lines, a new report from StudyPortals — an online education choice platform and research organization with around 3,000 education partnerships worldwide — used linear projection modeling of 15 high-income nations to outline eight mega trends impacting the future of universities and colleges around the globe. Here we outline how these trends are shaking up the industry in the U.S. and abroad, and what higher education leaders should consider to deal with them going forward. "After many decades of continuous growth of degrees at the expense of intermediate, middle-level skills, we may see some reversal, as technical and skilled manual work – i.e. electricians, plumbers, chefs – will be among the hardest to automate, while many degree-level occupations – e.g. law, accounting, routine computer programming, journalism, and data processing – are already being disrupted," said Finegold. He added that institutions need to prepare students to be entrepreneurial and resilient, with the ability to continue to learn and reinvent themselves and their careers multiple times in their lives. While enrollment worldwide in higher education has experienced a growth trajectory, the authors said the majority of this expansion is happening in middle-income nations, and that high-income countries have seen more of a stagnant trend. This can, in part, be accredited to factors like more English-language academic programs across Europe, developing countries investing in better educational resources and international student movements. 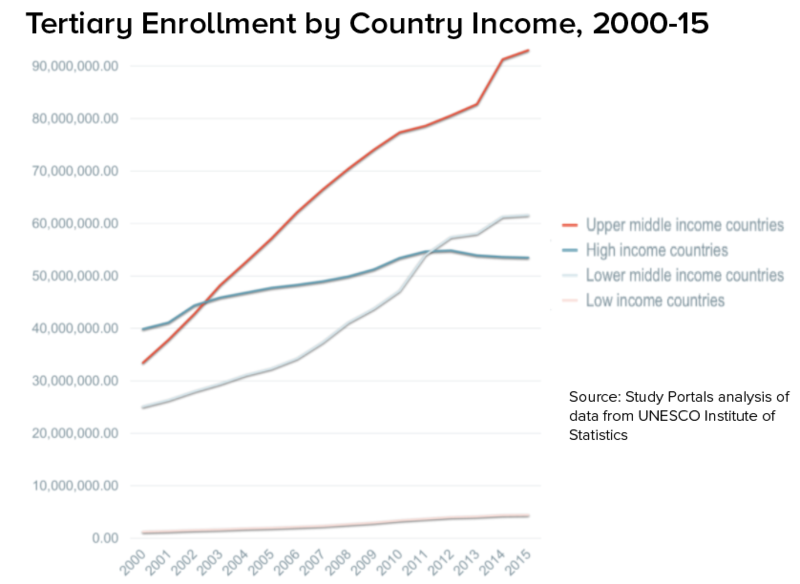 Using UNESCO Institute of Statistics data, the report authors found that lower-middle-income countries surpassed high-income countries in tertiary enrollment in 2012, though upper-middle-income countries still lead the way — a reality which reflects the growing presence of developing nations in the higher education worldwide. In particular, the authors said 75% of global STEM graduates will be concentrated in BRICS nations — Brazil, Russia, India, China and South Africa — by 2030, compared with 8% in the U.S. and 4% in Europe, which means higher education leaders should start looking for ways to reach out to students there. StudyPortals, "Envisioning Pathways to 2030"
A 2016 survey from PayScale, a company that researches information on salary, benefits and compensation, found that only about half of managers surveyed thought recent college graduates were prepared for the workforce. Rahul Choudaha, executive vice president of global engagement and research at StudyPortals and lead author of the report, told Education Dive it's important to address this disconnect, especially as institutions continue to come under fire for not adequately preparing students. Addressing this reality in the report, Ken Gill, CEO of NCIK—The University Consortium, said institution leaders consider more creative approaches toward giving students lifelong learning skills that are valuable long term. One way to do this is to start increasing global collaboration. "Increased automation will drive the mismatch of employment skills as the rapid changes in the workplace will not be matched with the speed at which the higher education sector can adapt," Gill said. "Emergence of world-class Asian universities would further undermine the 'old west' and a greater flow of students to the Far East, China in particular." "Capacity imbalance would argue for increasing use of technology and blended learning, creating more joint ventures, and combining institutions with specialized focus," he added. Based on world demographic trends, the report found more people are moving to bigger metropolitan areas, which Choudaha said is creating a much greater need for aligning education and jobs regionally. He explained as large cities continue to grow as centers of jobs and careers, the role of universities and colleges in local economic development becomes more critical, as well as industry-institution partnerships. Steven Kyffin, pro vice chancellor at the University of Northumbria at Newcastle in England, echoed these sentiments in the report, explaining higher education needs to adapt to regional needs. "The continued rise of the mega-cities and urbanization, especially in the emerging world will drive the need for different forms of enabling ‘education’ for all," Kyffin wrote. "The campus of the future will become a creative hub, where partners come together. So, not all universities have to be experts in all things." StudyPortals researchers' linear projection model shows a potential growth of about 412,000 international students enrolled across the 15 high-income nations between 2015 and 2030. Nearly three-fourths of the internationally mobile students have chosen to study in more developed nations, based on Millennium Development Indicators. Of note, about a third of these students, who account for 5.6% of tertiary institution enrollment, are in STEM majors, while another third are in business, administration and law. The United States enrolls more international students at the undergraduate level than countries including Chile, Poland, Spain and Japan, but lags significantly behind countries such as the United Kingdom, Australia and Denmark. Choudaha said the rise in anti-immigration policies, coupled with the need for increased enrollment, means institutions will have to find new ways of attracting international students. "How can they remain globally engaged when these immigration policies are not conducive to their missions, especially when they need students, say in STEM programs, that are necessary for employers and functioning of local economies?" he said. According to the UNESCO Institute of Statistics, by 2030 there will be an estimated increase of nearly 120 million students participating in higher education, with 2.3 million of them being internationally mobile. This represents a potential change of 51% in terms of an increase international student enrollment. The report finds between 2000 and 2014, there was a growth in global higher education enrollment from 100 million to 207 million, with 30% of those enrollments occurring at private institutions. 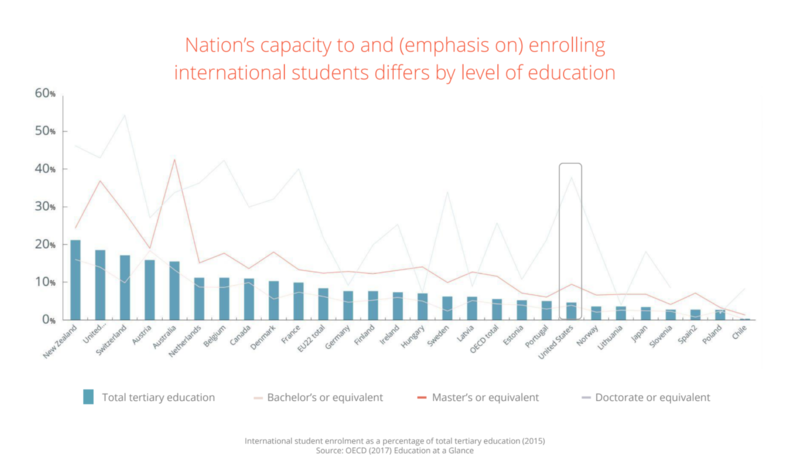 Interestingly though, Choudaha pointed out that it's the lower- and middle-income nations where demand is increasing, while higher-income nations tend to see more stagnant tertiary enrollment growth. He said as institutions in higher-income nations become more dependent on enrollment, it's critical these countries try to tap into developing parts of the world and offer program opportunities. Bradley Farnsworth, vice president for internationalization and global engagement at the American Council on Education, explained that rising incomes, and thus demands for educational opportunities in developing countries, means institutions have new opportunities for innovative educational business models. "We should anticipate the emergence of new modes of delivery, and in some cases entirely new types of institutions," he added. The report authors estimate that there will be a total of 4.3 million more students over the age of 24 enrolled in the 15 high-income countries from 2015 to 2030. Trevor Holmes, vice president of external and strategic affairs at Dublin City University in Ireland, explained this creates an imperative on higher education leaders to consider more creative ways of serving non-traditional enrollees. "Institutions will have to share resources and utilize emerging technologies like [massive open online courses] in a more creative fashion, utilizing globally but assessing locally," he said. "This will require a greater creativity in curriculum and program development." StudyPortals, "Envisioning Pathways to 2030" / OECD (2015) How is the global talent pool changing? Research shows states are spending around $9 billion less on higher education than they were in 2008. Other data from 2017 indicates about 33 states accumulated revenue below their original projections, resulting in cuts across higher ed budgets. As this trend of dried up resources continues to affect the industry, Stephen Jordan, president of Metropolitan State University in Denver, recently predicted “somewhere around 2025, there will be no funding in higher ed." To prove the value of higher education and generate proof of student return on investment, Wendy Purcell, a professor at Harvard University and emeritus president and vice chair of Plymouth University in the U.K., explained leaders need to offer more clarity on what degrees offer. She added: "We need to see lifetime education as a key trend to rebalancing the global economy. We need to have higher education cultivate thinking, aliveness and creativity – we are moving beyond content into experience."